AMPA and kainate receptors have traditionally been grouped together to form a 'non-NMDA receptor' family. However, kainate receptors constitute a separate group from the NMDA and AMPA receptors, although they share many of the same structural characteristics. They are built from multimeric assemblies of GluK1-3 and GluK4,5 subunits. GluK1-3 subunits can combine to form functional heteromeric and homomeric assemblies, at least when expressed in cell lines. Such receptors have a low affinity for kainate. GluK5 subunits are retained in the endoplasmic reticulum unless assembled with GluK1-3 ( Gallyas et al, 2003). Like the other ionotropic glutamate receptors, they possess an extracellular N-terminus that, together with a loop between TMIII and TMIV, forms the ligand binding domain and a re-entrant loop (TMII) that forms the lining of the pore region of the ion channel. They also undergo both splice variation and RNA editing, giving rise to a large number of possible receptors with differing pharmacological and functional properties. For instance, different splice variants of the GluK1, 2 and 3 receptor subunits show differential surface expression (Jaskolski et al 2004, 2005). Distribution of Kainate receptor subunits in rat brain. Note the co-localisation of GluK1-3 with GluK5 in the CA3, striatum and inner layers of the cortex. Kainate receptor subunits are widely distributed throughout the brain. 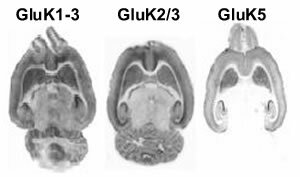 GluK1-3 subunits are found in somewhat higher levels in the CA3 region of the hippocampus, the striatum and the inner layers of the cortex. In contrast, GluK4 and 5 subunits have a much more restricted distribution, with GluK4 for almost excusively in the hippocampus (Darstein et al, 2003) while GluK5 subunits are also found in the striatum and the inner/outer layers of the cortex (Gallyas et al, 2003). Regions of overlap between the GluK1,2 or 3 and GluK4 or 5 subunits indicate areas with fully-functioning receptor populations. Until relatively recently, little was known about the functional and physiological roles of kainate receptors in the mammalian CNS. Kainate receptors have classically been implicated in epileptogenesis - intraperitoneal injection of kainate has long been used as a model for temporal lobe seizures. However, more recent developments in the synthesis of new, selective pharmacological tools and transgenic models for these receptors have led to significant advances in our understanding of the roles they play. It has now been shown that not only are kainate receptors synaptically activated but that they are crucial for synaptic plasticity. For example, they are critical for the induction of NMDA receptor-independent LTP at the mossy fibre synapse in the CA3 region of the hippocampus. Outside of the hippocampus, a major role for kainate receptors in synaptic plasticity in the somatosensory cortex has recently been revealed; during LTP, while AMPA receptor-mediated synaptic transmission is increased, kainate receptor-mediated transmission is reduced. These pages will detail the current state of knowledge regarding kainate receptor functions in the generation and regulation of synaptic transmission and in synaptic plasticity.